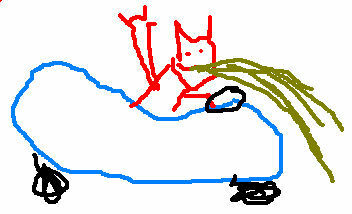 A drunk demon driving a dune buggy. Isn’t this a song by Morris Day & The Time? I am a bit needy and very jealous. Do I get a doodle? beth, if I only still had my magic jukebox, I would happily check! franiam, thanks for defending me from the likes of dr z. We’ll see about the doodle. I was hoping that having seven open doodle posts would have given anyone who wanted to suggest an idea an opportunity. But my mad doodlin’ skills are just too much in demand. Don’t worry, in the near future you shall have your chance. dc, I am *so* disappointed in you — what, you’re going easy on Laura Bush lately?!! ¡I like the hang loose action with the hand! I love this one. Let’s put it on a tote bag!